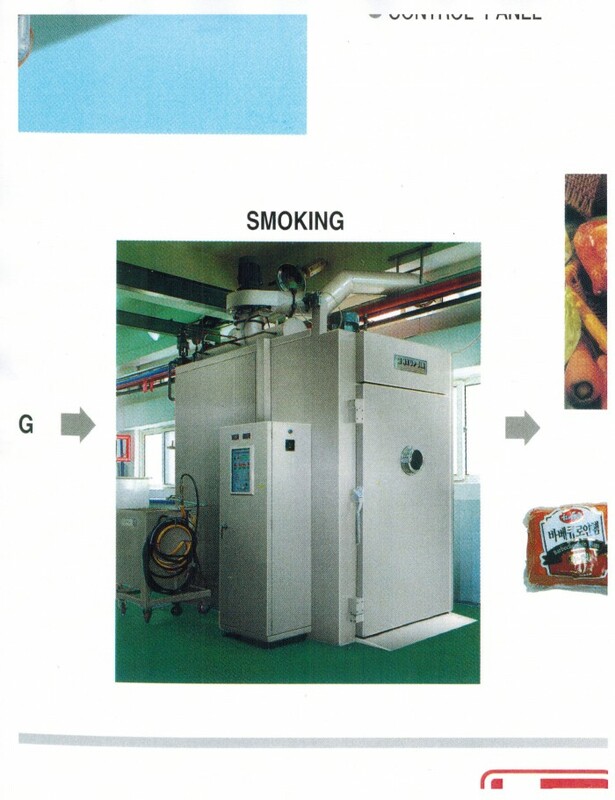 A smoking system for cooking food products includes a controller, a smoke generator electrically coupled to the controller, a smoke chamber including first and second trolleys juxtaposed side-by-side, and a first duct with opposed ends directly coupled to the smoke generator and the smoke chamber. 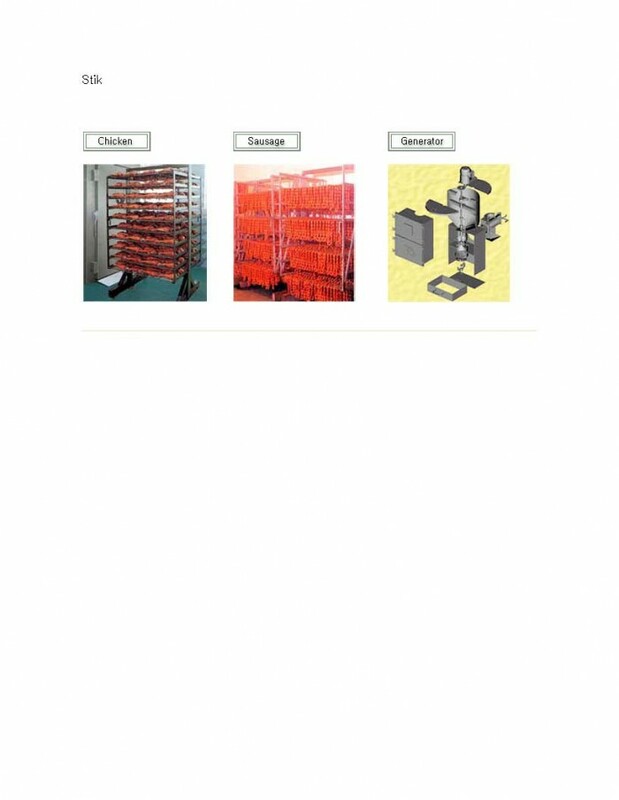 The system further includes a plurality of circulation motors, second and third ducts directly coupled to the motors and the trolleys respectively, and a cleaning section in fluid communication with the first and second trolleys. A ventilation motor is directly connected to the cleaning section, and a fifth duct is provided with an associated damper. This is to introduce the following machine that is called as “Smoked Chicken House Chamber”. 1)	This was invented and patented machine in USA, as per the attached issued by US Patent and Trademark office. 2)	Mass smoked-chicken processing. See the attached product description. 3)	This is an innovative machine that is being introduced for the first time in the United States. Chickens are not as available and cheap, as it is in the United States. In this regard, I chose to study a smoking recipe for chicken, which enables us to sell smoked chicken by piece at an inexpensive price at convenience stores and markets. Fried chicken is easy to deteriorate and has to be stored in a freezer compartment. However, smoked chicken produced by this machine, can be stored in a refrigerator compartment, which therefore decreases the operation time to only a staggering quarter of the time it takes to cook frozen fried chicken on a standard microwave oven. Also, we have results that a lot of fats are removed during the course of smoking. So it will draw attention as a healthy, low-fat food of the future. As a matter of fact, this machine can be used for turkey, too. In fact, it completely differentiates itself substantially from the quality of everyday turkey sold in markets. If you could have your brand of smoked turkey on your the dining table of many Americans Thanksgiving, the biggest celebration dinner for Americans, your company will not receive disappointing results. In addition, the current economy is quite different from the previous economy. Consumers will seek a more economical and inexpensive lunch. Smoked chicken sandwiches accompanied with a helping of Coke will make a great lunch. 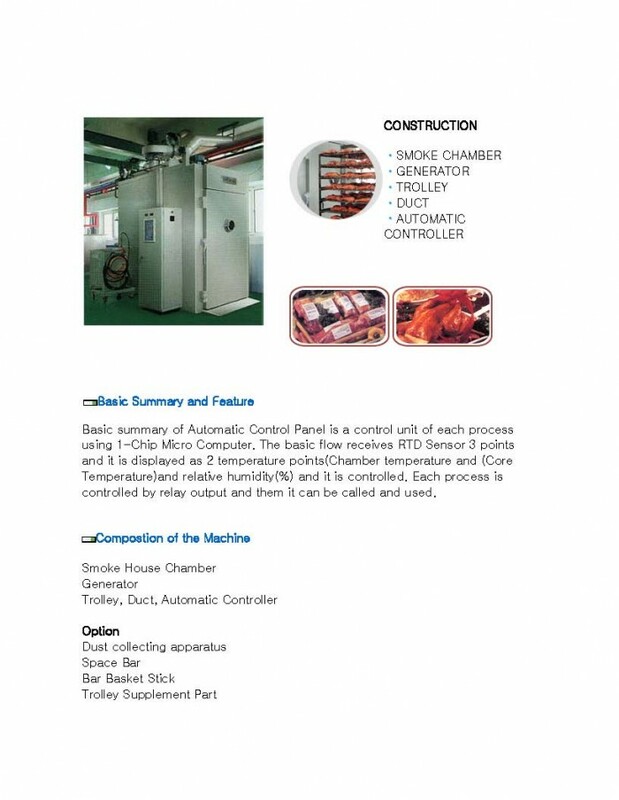 The Smoked Chicken House Chamber is a food processing system which is designed to process, cook and package various types of meats. However, primary usage of the Smoked Chicken House Chamber envisioned by the inventor is to smoke chicken. The most unique benefit of the food that are processed by this chamber is that you can produce healthier products like low-carb chicken and turkey. In Korea, the attached final product is being sold everyday in the food market. For example, 7-Eleven is selling the final product, in the corner of every city of South Korea. Second: The chickens are smoked in the Smoked Chicken House Chamber for one and half hours. 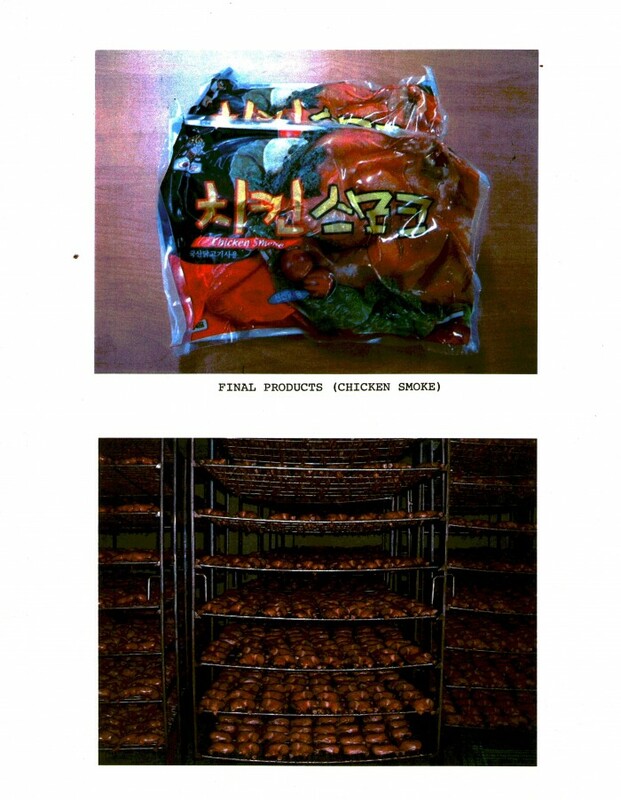 Third: The chickens are then removed to be cut into 1,600 pieces and packed in vacuum sealed package as shown below. please contact us at 323-251-7705 or 213-387-1166 for more detail information about this great invention anytime. 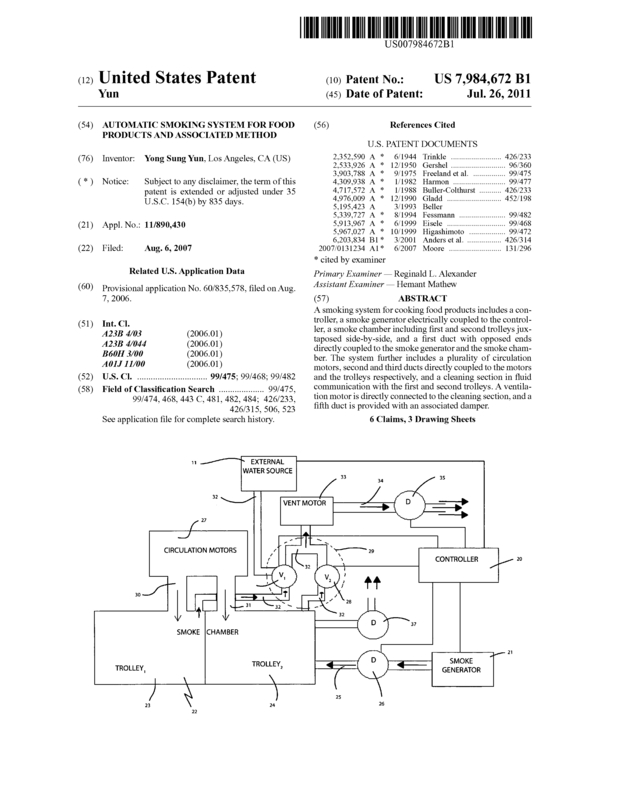 Page created at 2019-04-21 4:18:34, Patent Auction Time.